In a resolution passed by the Academic Senate for California Community Colleges (ASCCC), faculty statewide officially endorsed the CCC Education Planning Initiative (EPI) tool suite for use as part of colleges’ guided pathways frameworks. 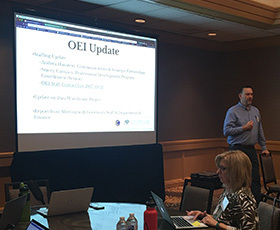 Since the inception of the Online Education Initiative (OEI), many California community colleges have collaborated to increase student access to fully resourced online courses that address achievement gaps and propel them toward completion. 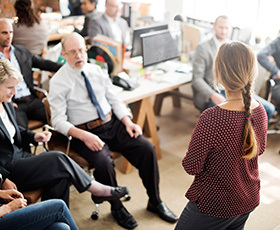 The Chief Information Systems Officers Association (CISOA) for the California Community Colleges is currently accepting applicants for the year-long Chief Information Systems Officers Certification Program, which will begin in March 2018. 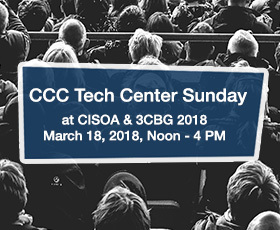 For the second year in a row, the California Community Colleges (CCC) Technology Center will be featured at the annual CISOA & 3CBG conference with an exclusive, half-day event focused on systemwide technology programs. 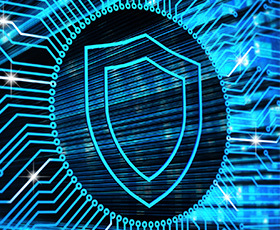 Information security attacks are a real threat, with more network breaches occurring every year — and colleges are frequent targets. A single breach can expose the personal information of thousands of people, and could leave the college district liable. Registration is open for the Online Teaching Conference (OTC'18), happening June 18-21, 2018, in Anaheim, Calif. In addition to two full days of conference programming, several full- and half-day pre-conference workshops are also available, with topics including designing and teaching courses in Canvas, online course accessibility, and other distance education tools and techniques. 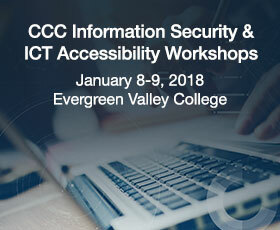 Registration is open for the winter IT workshops, presented by the California Community Colleges (CCC) Information Security and Accessibility centers. The workshops will be held January 8-9, 2018, at Evergreen Valley College, San Jose. **Deadline extended to Dec. 1** The Online Network of Educators (@ONE) is providing a select number of scholarships for California Community Colleges (CCC) faculty, staff and administrators to attend the first annual Global Society of Online Educators (GSOLE) International Online Conference. Two technology vendors are hosting free webinars to help California’s community colleges gain a deeper understanding of their products’ functionality. On Nov. 29, Dropbox will discuss data security in the cloud, and on Dec. 7, Adobe Creative Cloud for Enterprise will cover named user deployment.